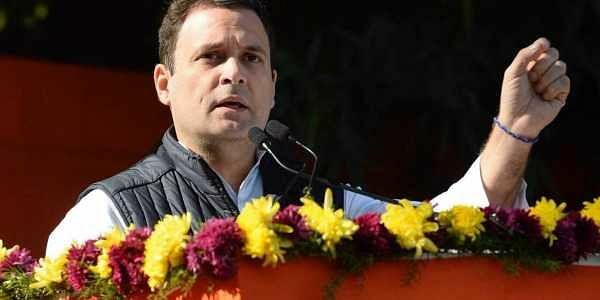 NEW DELHI: Congress President Rahul Gandhi has said that his plan is to transform the Congress from bottom upwards and he will like to bring in many new, young, exciting and dynamic faces. In his first interview as party president with National Herald and Qaumi Awaz, Gandhi rubbished BJP's claims that his party fought the recently held Gujarat state elections on casteist lines and said that the party brought the OBC, Dalit and the Patidar communities together on a Congress platform. Gandhi also strongly attacked the Narendra Modi government, saying "there is bankruptcy in the nation." Answering a query, Gandhi said his plan was to transform the Congress from bottom upwards. "But it is not just my plan, it is the desire within the Congress party to transform, evolve and change itself, and I would try and help to enable that," he said. Gandhi said he will bring further democratise the Congress. "That is certainly my intention. We have done a lot of work in the Youth Congress and NSUI, and very successful work at that. We would like to bring in as many new faces, young faces, exciting faces and dynamic faces (as we could). That's not to say that people who are experienced or older should not have space." Gandhi alleged that the Modi government had far less talent compared to Congress-led UPA government. "Just imagine those names. Compare a Manmohan Singh Ji with Mr. Modi. Compare a Chidambaram to Mr. Arun Jaitley. Tell [me], who can you compare Pranabda within their government. Tell me, who can be compared with Mr. Antony in their government. So, when you actually look at them, from a policy perspective, it's not much weight there. You can see it, when you listen to them. I mean, what is being done to India's foreign policy is an out and out disaster," he said. Asked about fear and insecurity among the people, Gandhi said it has happened earlier. "Look at Indian history -- this has happened. A sort of polarisation you saw in the 1990s as well. But I primarily think that this country stands together, and we believe very deeply in love and affection.."
He alleged that there has been a large organised defamation campaign against the Congress party, carried out by the BJP and the RSS. "I really felt this in Gujarat, that certain myths have been created, which are just lies," he said, adding that Jawahar Lal Nehru and Sardar Patel were friends. He said Sardar Patel had also banned the RSS. Answering a query, Gandhi said the party has a lot of talent and has lot of work to do. "There are a large number of new people that we have to bring forward. There is tremendous talent in the Congress party that we have to utilise. "We are going to show to the country, the true face of the Congress Party. You are going to see a change in the Congress party, you are going to see more of people who excite you, people about whom you can say that they are somebody very interesting who have been put there by the Congress party. We would like to be associated with decent persons and solid persons." Gandhi alleged that BJP believes in a philosophy "guided by hatred." "Their leaders have been imbibed with such philosophy for years. Look at the comments made against an ex-Prime Minister." Gandhi said Congress was a dynamic and an organic party and will open its doors and "provide the youth of the country with an alternative vision, that's premised on love and brotherhood." The Congress president said Indians had thought three years ago that we could bear with the shortcomings in RSS' vision for India if they can deliver economic growth. "While flaws in RSS's vision still remain, Indians haven't benefited a great deal economically either." Gandhi said the central problem of the country was that it is simply not producing enough jobs. He also slammed demonetisation and Goods and Services Tax and said economy had been crippled.